Did you know March 15 is World Sleep Day? 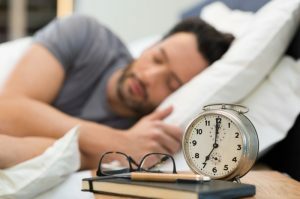 If the thought of spending an entire day with your head resting comfortably against the pillow sounds like an impossible dream, it may because you’re experiencing sleep apnea in Grapevine. Affecting millions of Americans each year, if it is left untreated, it can have deadly consequences. Find out more about this sleep disorder and what you can do to treat it. Having trouble sleeping? Does your partner tell you that you sound like a buzz saw? Sleep apnea may be the culprit. When your breathing starts and stops throughout the night, it may be the result of a blocked airway, preventing air from reaching your lungs. When your tongue and throat relax, it can block the airflow and lead to snoring or waking up gasping for air. If sleep apnea goes untreated, it can lead to serious health conditions such as heart attack, stroke, obesity, or hypertension. If any of these are left to worsen, it can ultimately lead to death. What Are the Symptoms Associated with It? While a continuous positive airway pressure (CPAP) system is a method of treatment many patients use, this bulky contraption is often difficult and uncomfortable for many to use. An alternative approach is the use of oral appliance therapy. Should your dentist in Grapevine believe this treatment will work for you, a custom-crafted appliance, much like a mouthguard, will help to prevent obstructive sleep apnea (OSA) by shifting your jaw. Don’t worry, it’s nothing too drastic, just a gentle adjustment that places pressure on the throat muscles so your airway remains open. Your doctor may also suggest some lifestyle changes, if necessary. Since many individuals who battle sleep apnea are also overweight or obese, you may want to make changes to your diet and begin exercising. If you’re a smoker, you will also want to find a way to quit. Don’t let World Sleep Day be something you dread! Take the day off and enjoy catching up on some well-deserved sleep. With proper treatment, you’ll be getting the rest you need in no time. Dr. Greg D. Martin, DDS, earned his undergraduate degree from Texas Wesleyan University before joining the Martin Dental Practice. He then went on to pursue postgraduate studies at the University of Texas Health Science Center in San Antonio and received his Doctor of Dental Surgery degree from Howard University College of Dentistry, graduating second in his class. With close attention to detail, he uses cutting-edge technology to provide exceptional care to his patients. To learn more about Dr. Martin, visit our website or call (817) 481-1041.